Writers today have more tools than ever to choose from. We can tap out notes on a phone or type our stories on a laptop or tablet. With all the spellchecking, grammar checking, sync, and instant backups at our fingertips, why would anyone still bother to write by hand? What can a pen and notebook give us that a word processor can’t? A slower process. In today’s on-demand culture, that might not sound like a benefit. But when it comes to writing, faster isn’t always better, and writing by hand can force you to slow down and weigh your thoughts as you put them on paper. Fewer distractions. When you write by hand, there are no emails, games, or social media to demand your attention. You can also write in a coffee shop without scoping out the available power outlets — and while I’ve learned the hard way that waterproof ink is sometimes a good idea, I’ve still never gotten an error message from a notebook. A different mindset. For me, there’s something very direct and true about writing first drafts by hand. Typed writing can feel “finished” before its time, and while I’d never trade a computer for editing, the drafting process feels more intimate in my own handwriting than a font. I’m sure some of this is generational, but to me, writing done by hand is writing for the self, while typing on a keyboard puts me in a “public writing” mindset — blog posts, emails, functional writing instead of creative — where writing by hand reminds me of childhood days spent scribbling stories in wide-ruled notebooks, and reminds me that writing is supposed to be fun. A journal feels like a safe, private, patient space to experiment, in a way a blinking cursor can’t duplicate. My notebooks also place my writing within the larger scope of my life. Interspersed among story drafts and notes are quirky lists of favorite commercials, possible character names, passages I’ve loved from books and poems, and the odd to-do list. To me there’s something delightfully grounding in that. There’s also a physical pleasure in writing with a good pen on quality paper, and there’s a sense of accomplishment that comes with filling pages in a journal that isn’t quite matched by keeping track of word counts in a spreadsheet. Keeping a notebook isn’t for everyone, of course. Some have physical restrictions that make writing by hand impractical, and if you’re prone to losing things, you’re probably better off with tools that allow for backups. Writers who keep notebooks have to be comfortable with a certain amount of chaos and inefficiency, but out of that chaos can come a playful serendipity that brings renewed focus, deeper contemplation, and revitalized creativity — all from putting pen to paper. My current journal, open to the notes and brainstorming for this blog post. Choose materials you’re comfortable with. That might be a handmade leather journal or a black-and-white composition book, a pencil or a fountain pen. Different moods and projects can also call for different tools. Take it along. 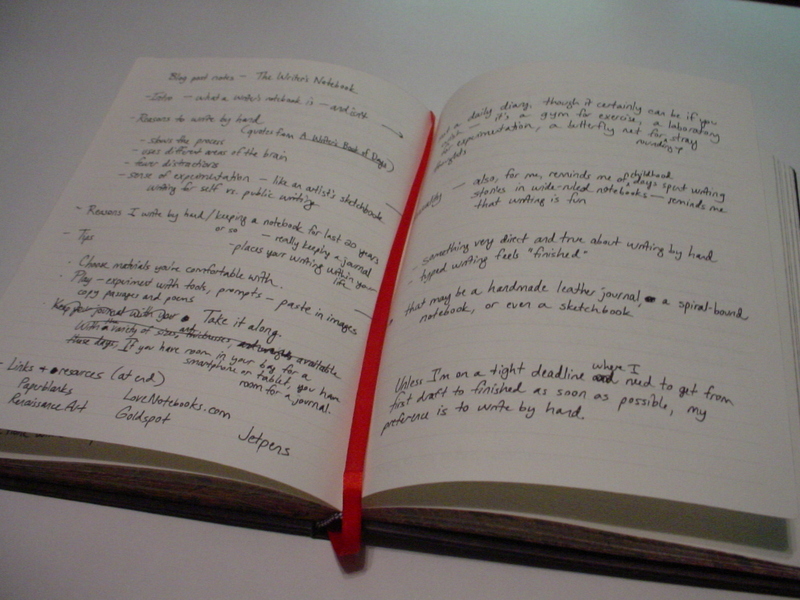 Try to choose a journal you can easily carry with you, or keep one at home and a smaller one in your bag. Play! Experiment with tools — write in pencil, marker, crayon. Try out prompts. Paste in pictures from magazines, cancelled stamps, ticket stubs. Make it part of your life, not just your writing life.